This service is recommended to professional writers who wish to receive coaching on particular writing skills or ways to develop their texts. This is the primary service recommended to high school and college students with writing assignments in any discipline. In an hour, expect to read and discuss up to 7 pages, 2–3 writing skills, or 1–2 major topics. This service is recommended to professional writers with long projects, such as books, theses, dissertations, and journal articles. You receive a separate document containing my notes on each chapter or major section. You then revise your work, deciding which suggestions to implement. Writing Consultations are available if you would like real-time assistance developing your text. Please note that I do not suggest edits as part of this service. Editing and proofreading are contracted separately. When you are satisfied with the content of your work, I polish your writing (see "writing style" in Writing Consultation above). I also proofread for spelling, grammar, and punctuation. When you are satisfied with the content of your work, I ensure the format of your in-text citations and references complies with your chosen style guide. 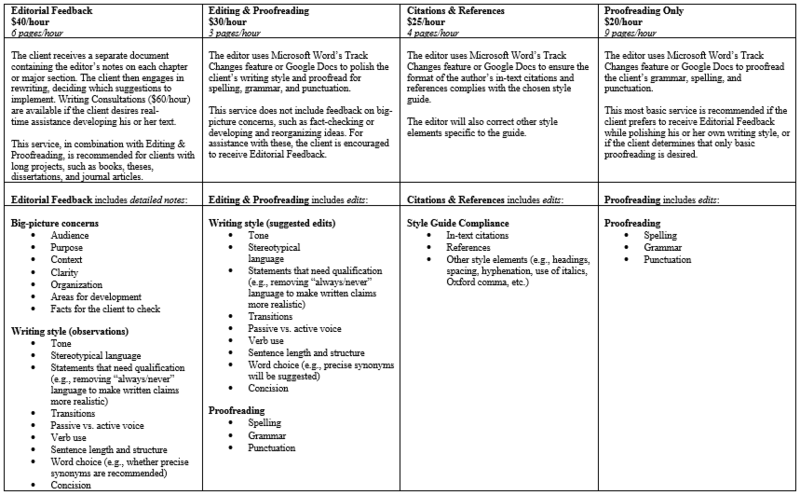 I am most familiar with APA Style but also edit per other guidelines. Special Rate: For projects whose budgets exceed $350, all services are available at $20/hour if you are a student, teacher, artist, or nonprofit organization. Please specify if you wish to be considered for this rate.